Tree Palmedo recently took part in a recording project that got a great review in JazzTimes. Click Here to read the review from JazzTimes. Tree was a Brubeck Fellow and member of the BIJQ from 2011-2012. Tree is now studying at Harvard College (Class of 2016) in a joint program with the New England Conservatory, where he studies with John McNeil and Laurie Frink. The Brubeck Institute Jazz Quintet for 2013-14 is taking on a whole new look and a whole new vibe. For the first time since the group comprising some of the nation’s top young jazz musicians was formed, there is a female member, and no pianist. And, for very nearly for the first time, there is a completely new set of musicians. “This is an interesting group – a significant one since we have five new spots opening this year,” said Simon Rowe, Brubeck Institute executive director. The members of the much-honored group are in the Institute’s Fellowship Program, one the Institute’s five programs. Quintet members undergo intense academic preparation, a strenuous performance and appearance schedule, and are mentored by some of the finest jazz musicians in the region. Pacific’s Brubeck Institute was founded in 2000 and named in honor of Pacific alumnus and iconic jazz pianist Dave Brubeck ’42, who died in December. “It’s interesting that we don’t have a pianist this year. And hopefully Dave looking down would approve the less conventional lineup in the spirit of adventure,” said Rowe. Rowe is pleased about the cultural makeup of the 2013-14 group – two African-Americans, two Caucasians and an Asian-American – because it is consistent with Brubeck’s stance of embracing diversity. The incoming freshman musicians can expect their lives to changes as Brubeck Institute Fellows. The Brubeck Institute and the Brubeck Institute Jazz Quintet has seen great success since being founded in 2000, including recent performances at the Smithsonian American Art Museum in Washington, DC, and the United Nations in New York City. 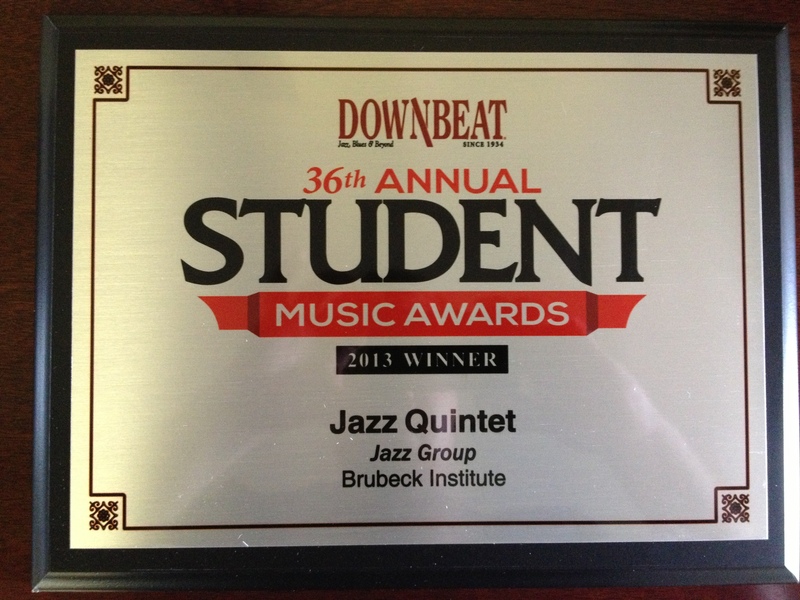 Two different Brubeck Institute Jazz Quintets were recognized as the best collegiate group in Down Beat Magazine’s 36th annual Student Music Awards, the sixth and seventh time the group has been recognized by the magazine. “I also expect great things from the graduating group,” Rowe said of the 2012-13 Brubeck Institute Jazz Quintet – Rane Roatta, tenor sax, of Miami, Fla.; Thomas Kelley, alto sax, of Canton, Conn.; Paul Bloom, piano, of Needham, Mass. ; Adam Goldman, bass, of Pacific Palisades; and Malachi Whitson, drums, of Richmond. 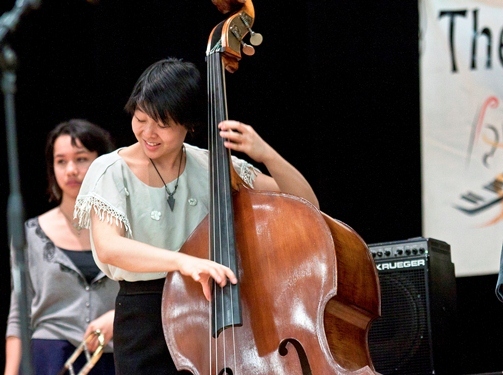 Bassist Sarah Kuo of Los Angeles is a 2013 graduate of the Los Angeles County High School for the Arts. She discovered classical bass at age 12 and jazz at 14. She credits the mentorship of Grammy-winning bassist, composer and conductor John Clayton; J.B. Dyas, former Brubeck Institute executive director and currently the vice president of Education and Curriculum Development at the Thelonious Monk Institute of Jazz; Jason Goldman; David Young and others. Kuo’s performances have been recognized by CBS, KXLU 88.9 FM, Jazz Times and Jazzday.com. She has received awards from organizations such as Spotlight, the Monterey Jazz Festival, and the Angel City Jazz Festival. In the past few years she has performed with the likes of Herbie Hancock, Ingrid Jensen, Antonio Hart, Robin Eubanks, Bob Mintzer, Natalie Cole, Lisa Henry, and Barry Manilow. Jalon D’Mere Archie grew up in northeast Houston, Texas, and has been playing percussion for as long as he can remember. As a child he played on everything – the table, the floor, the bed, his lap. Archie was in The Skidmore Jazz Program in 2011. He has participated in the All City Band (2004), All-Region (2011 and 2012), All-State Alternate (2012), Diaz Institute (2007-2008), Summer Jazz Workshop (2004-2006), and the American Festival for the Fine Arts Institute (2008). Archie has been mentored by artists such as Sebastian Whitaker, Marvin Sparks, Wilbert Archie and Matt Wilson. Trumpet player Max Boiko is a 2012 graduate of the Dillard Center for the Arts in Fort Lauderdale, Fla., which was the 2011 and 2012 winner of the Essentially Ellington Jazz Competition in New York City. Boiko received the Outstanding Soloist Awards both years. Boiko started studying the trumpet in seventhgrade and since then has won numerous awards and scholarships in national and state competitions and summer programs including The Brubeck Summer Jazz Residency (2011 and 2012), the GRAMMY Band Jazz Session (2011 and 2012), the Next Generation Jazz Orchestra (2012), Jazz Band of America (2012), the Vail Jazz Festival All Stars (2011), the Florida All-State Jazz Band and Orchestra, and Florida’s Gold Coast Jazz Society. Boiko has studied with Wycliffe Gordon, Jim Catch, Sean Jones, Wynton Marsalis, Jim Rotondi, Dave Stricker, Terrell Stafford and Bryan Lynch. Guitarist Sean Britt is a 2013 graduate of Hingham High School in Hingham, Mass. He received his first guitar on his 10th birthday and began studying jazz at age 13. Britt has performed in many venues, including the Newport Jazz Festival and Boston’s Symphony Hall. He was named to the 2013 Massachusetts All-State Jazz Band and is a 2013 National Young Arts Foundation winner in jazz guitar, a 2013 GRAMMY Camp Jazz Session finalist, and a 2012 Brubeck Institute Summer Jazz Colonist. He is currently working and teaching as a musician in Massachusetts and plays frequently with his own band, The Harbor Jazz Quartet. Britt has studied with Tim Miller, Pat Martino, Stefon Harris, Steve Houghton, Bob Sneider, Clay Jenkins, Dariusz Terefenko, Wes Wirth, Jamie Stewardson, Carlos Jimenez, Brian Cincotta, Brubeck Institute Associate Director Nick Fryer and Chad Lefkowitz-Brown. Vibraphonist Joel M. Ross has established himself as one of the most promising high school jazz musicians in the Midwest. 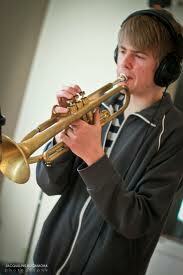 Ross is a student at the Chicago High School for the Arts and performs with the top ChiArts Jazz Combo. He started on percussion at Beasley Academic Center and has performed with Chicago Public Schools All-City Bands, winning musician of the year in 2009. Ross has performed with noted artists Herbie Hancock, Christian McBride, Antonio Hart, Terell Stafford, Wycliffe Gordon, Gerald Clayton, Nicole Mitchell, Eric Reed, Benny Green, Maurice Brown and Jarrard Harris, as well as with the Jazz Institute of Chicago’s Jazz Ambassadors under mentors Willie Pickens, Pat Mallinger, Lorin Cohen and Tito Carrillo. He was selected as a 2013 YoungArts finalist in Jazz, a 2012 and 2013 Thelonious Monk Institute of Jazz National All-Star, and was a 2012 participant in the IMEA State Music Competition. His high school group was selected as a group to perform at the 2013 Jazz Education Network Conference in Atlanta. He has performed at the Chicago, Hyde Park and South Shore jazz festivals. 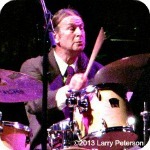 Here is another wonderful write up about the recent Dave Brubeck Tribute by Doug Ramsey. At the very moment that last evening’s memorial service for Dave Brubeck got underway, the rumble of thunder penetrated the massive Gothic walls of New York City’s Cathedral of St. John The Divine. A murmur ran through the throng filling the 120-year-old church. 5/4, 9/8 and assorted other time signatures sounded through the cathedral as combinations of musicians remembering Brubeck played a dozen of his compositions. Catherine Brubeck, pictured here with her dad, told of the time in the 1950s that her father came off the road to their home in the Oakland hills above San Francisco Bay and initiated a jam session with his very young sons. She was two years old. Inspired by the family musicale, she slipped into her tiny tutu and danced around the room. That, in turn, inspired Brubeck to write “Cathy’s Waltz.” After she told the story, Catherine introduced her brothers Darius, piano; Chris,bass; Danny, drums (pictured); and Matthew, cello; who played her song. That initiated a succession of performances by musicians young and old, from the Brubeck Institute Alumni Quintet in their early twenties to bassist Eugene Wright (pictured), the surviving member of the classic Brubeck quartet of the 1950s and ‘60s. Two weeks short of his 90th birthday, Wright joined Darius to play “King For a Day,” his feature from Brubeck’s musical The Real Ambassadors. 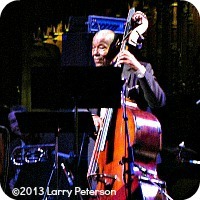 Below is a post from 88.3 fm WBGO.org’s BLOG covering the Dave Brubeck Tribute that took place on May 11th, 2013. May 12, 2013. Posted by Becca Pulliam. Just before 4:00 Saturday afternoon, thunder clapped outside St. John the Divine on Amsterdam and 113th St. Inside, Dave’s widow Iola Brubeck spoke, her voice steady, strong and lower pitched than I expected. She and Dave were married for 70 years. Since her husband’s death, Mrs. Brubeck and her family have received and read hundreds of letters, she said, and the word JOY kept popping up. They planned this celebration to capture some of that joy. She went on to say (paraphrasing) that she and Dave first entered this cathedral on Duke Ellington’s birthday, April 29, 1976 – two years after his death. The event was called Ellington Forever. The Duke Ellington Orchestra played, Mercer Ellington directing, with the Youth Symphony Orchestra and a choir, a constellation of guest artists, a United Nations of diplomats, and First Lady Betty Ford in attendance. An arc from Duke through Dave touched down on us yesterday in this, the world’s largest cathedral, full of people from stem to stern. We gathered for stories and music. Sirius XM’s Mark Ruffin hosted. Twenty-eight musicians performed, sharing the Brubeck impulses toward justice and joy. Dave and Iola’s daughter Cathy told us how she would dance, crash and twirl around the living room as her dad and brothers played. She introduced Matthew, Darius, Chris and Dan Brubeck on cello, piano, bass and drums and “Cathy’s Waltz.” Then in a smooth sequence varied groups offered a Japanese melody, a blues with lyric by Iola, piano duet on “The Duke,” “The Golden Horn” composed on the Turkish phrase for “Thank you” featuring exceptional moments from Renee Rosnes and trumpeter Randy Brecker, and a movement from Dave’s balletGlances. Chris and Dan Brubeck were recurrent players on bass and drums. In letters read by Dave’s producer Russell Gloyd, Mayor Bloomberg and President Clinton both noted that the first jazz concerts they ever saw were Dave Brubeck concerts. (Me too. Milwaukee. 1965?) Clinton wrote that – at age 15 – after he persuaded a dear friend to drive him 50 miles to see Brubeck, “I went home and practiced until my lips bled.” In 1994 Clinton presented Brubeck with a National Medal of the Arts. Eugene Wright, the bassist and sole survivor of the Dave Brubeck Quartet of 1958-67, played “King For A Day” with Darius Brubeck on piano. Dave was quoted as saying that Wright had a “Jackie Robinson kind of dignity.” Wright’s full, round tone is still a joy, 45 years later. In 1962 President Kennedy invited the Brubeck Quartet to play at a party for White House interns. Tony Bennett joined them with no rehearsal on four tunes. Columbia Records recently discovered the tapes, misfiled, and on May 28 will release this momento from Camelot. From it we heard “There Will Never Be Another You,” fast and swinging and present, and Tony Bennett stepped up to say that when he sang with Dave at Newport, the New Orleans Festival and Montreal, it was always spontaneous and unexpected. Branford Marsalis interpreted “For Iola” on soprano, a beautiful reading. Chick Corea was the only pianist to play alone, “Strange Meadowlark.” Young graduates of the Brubeck Institute in California played “Blue Rondo a la Turk,” and there was a great short session on “Blues for Newport” with the tick tock of a clock built into the melody. St. John the Divine is so reverberant that Iola – in her welcome – suggested that music from the 1985 performance of Dave’s Mass to Hope might still be present in the space. I hope it is true of yesterday’s shared joy as well. This was the “Google Doodle” from May 8 celebrating the 93rd Birthday of graphic designer Saul Bass. 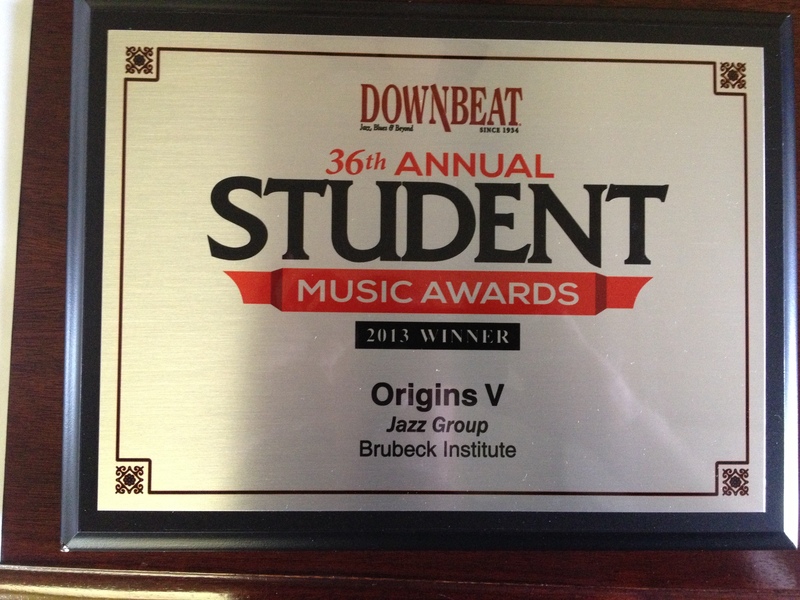 We are to excited to announce that we have won two awards in Downbeat’s 36th Annual Student Music Awards. We are very proud of the hard work and accomplishments of these students! For more info you can visit JAZZCORNER.COM to read a nice feature that they wrote on the Brubeck Institute and these recent awards.